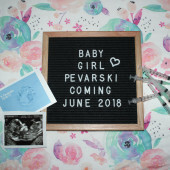 We are so grateful for each of you and your support as we get ready to welcome Baby Girl Pevarski! Please know that we haven't registered for any books but welcome your favorites for building her library! If you haven’t used BabyList before, items have been added from various retailers and you can see all places they’re available for purchase. Make sure to mark items as “reserved” and then “bought” whether you buy online or in a store.